Professor Mohamed Eddaoudi, associate director of the University's Advanced Membranes and Porous Materials Research Center, leads a team of researchers at KAUST who are developing porous solids called metal-organic frameworks (MOFs) for the selective removal of various gases from gas mixtures. Their latest breakthrough material can effectively take up carbon dioxide even when it is present at concentrations as low as 400 parts per million and opens possibilities for capturing CO2 as it is generated. "The discovery of this latest material for capturing carbon dioxide is the result of about four to five years of work on this unique MOF platform," said Eddaoudi. He explained that the key challenge was to create something that could exceed the performance of existing options while also greatly reducing the energy requirements over the full cycle of operation. 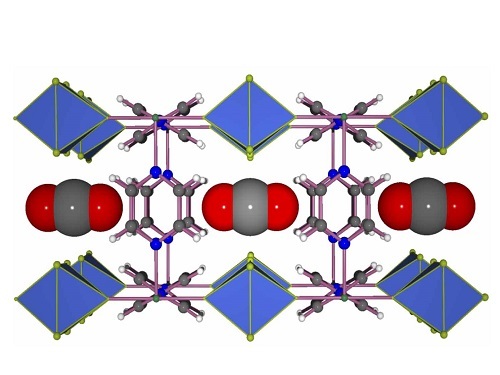 The researchers' response was to develop a fluorine-containing MOF in which square-grid layers encompassing Ni(II) metal centers and pyrazine linkers are bridged via pillars composed of niobium, oxygen and the fluorine atoms. "The ability to control the distance between the fluorine atoms allowed us to create the ideal square-shaped pockets for trapping carbon dioxide molecules effectively and efficiently and giving our material such impressive performance," said Eddaoudi. "We are now working to scale up the use of this material, allowing us to seek industry collaboration towards eventual commercialization," Eddaoudi said.